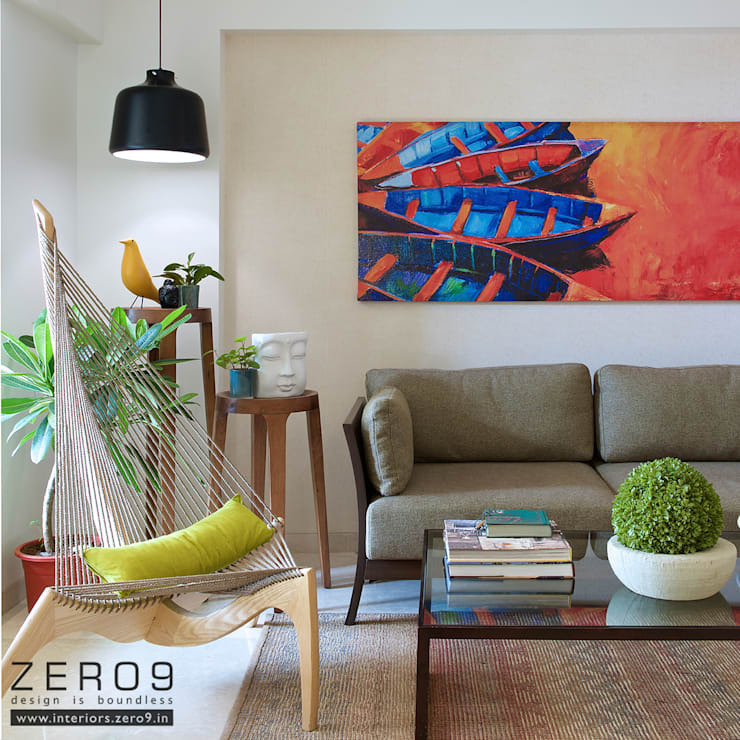 An Amalgamated Apartment, infused from a adjoining 2BHK and 1BHK, were coined as a challenge to the design team at ZERO9. 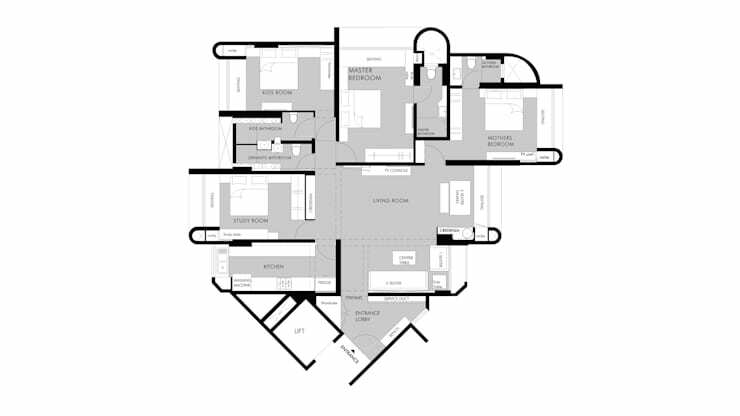 The apartment was stripped down to mere skeleton to analyse the maximum available spaces which led to an efficient planning as per the clients requirements of a 4 Bedroom Apartment. Apart from the requirements of a stylish urban apartment, the clients desired to have a home with the warmth of nature felt throughout the day. The broad daylight and the breezy cross ventilated characteristics of the apartment were to be retained and maximised with the design. 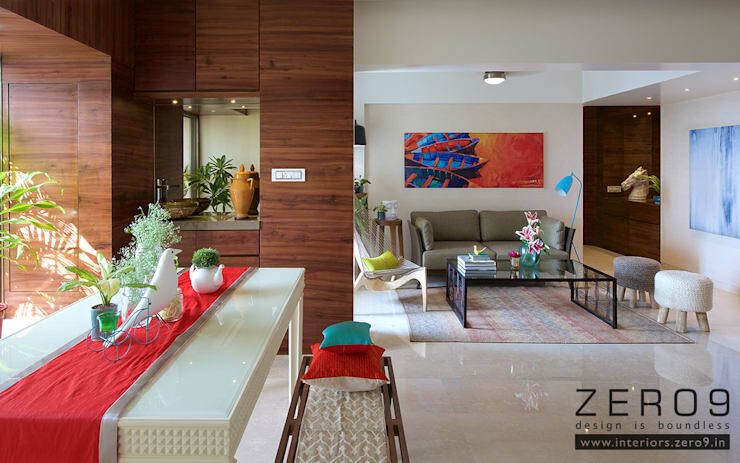 Leisurely window seats are an ultimate luxury in a modern day apartment set in a busy city like Mumbai. This was maximised in almost all the spaces and enhanced with potted plants across the windows. 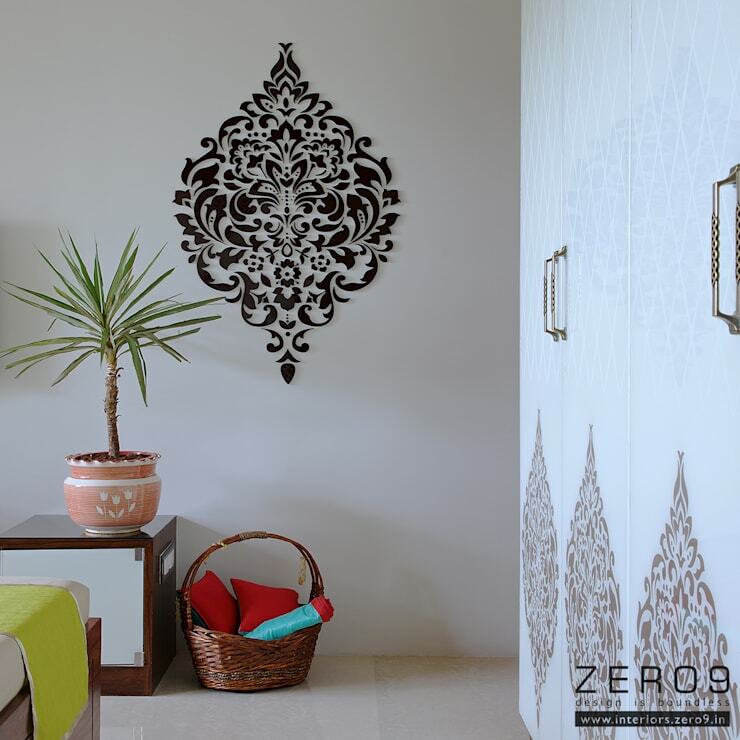 The interior styling was done specifically to enhance the outdoor experience within the habitable space to bring in a dash of nature with an artistic expression. 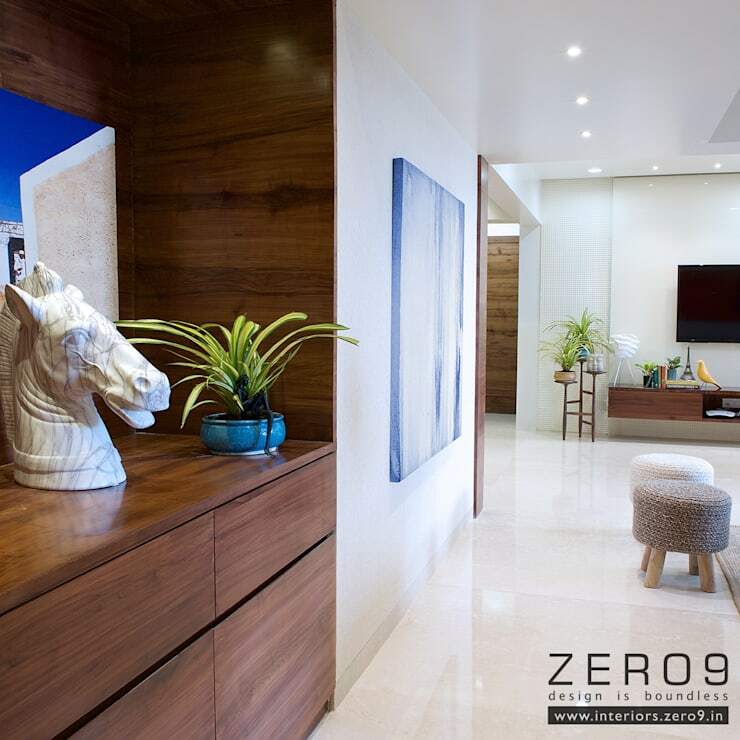 The foyer was aptly designed to receive the guests and handle the daily chores with ample storage space around. The Living Room with a divisional beam was rightly used to segregate seating space and the dining area. The seating with a cosy light pocket nearby was maximised with the string chair which let the light pass on to the living space. 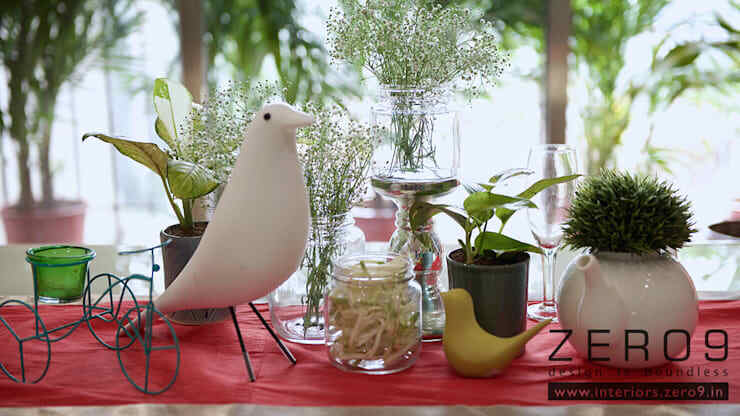 The corner table was accentuated with greens, birds and buddha to bring in an effect of the outdoors to the indoors. The Dining table, with a bench seating on one side an window seating on other side welcomed whole heartedly the broad daylight into the living space. The TV unit comfortably placed from the seating ensured a lot of open space for kids to have their own space while playing. A credenza unit with a patterned mirror was placed a far end of the window to bring in depth to the space. 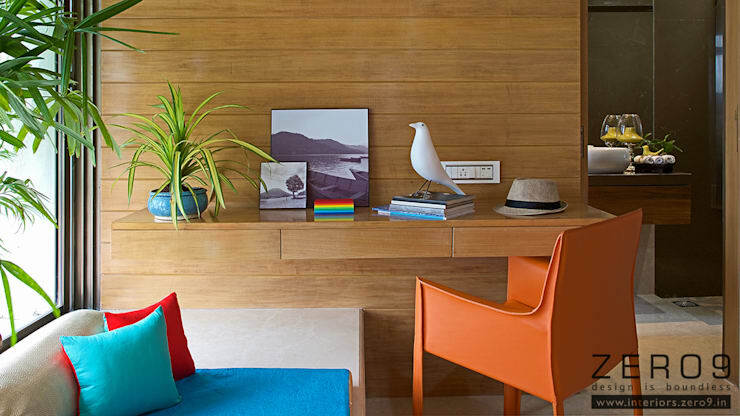 A simple grooved veneer panelling created an apt backdrop to the window seat. The study space with a simple desk ledge makes a perfect work at home space. 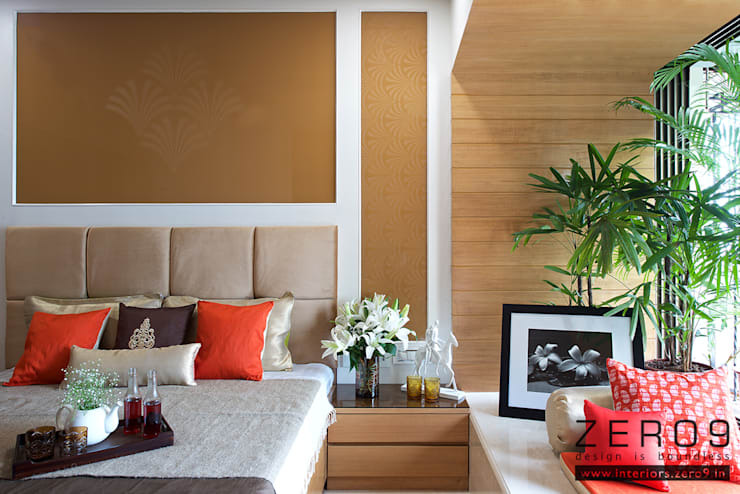 The contemporary interpretation of the old world wooden panelled wall makes a perfect visual treat to this space. 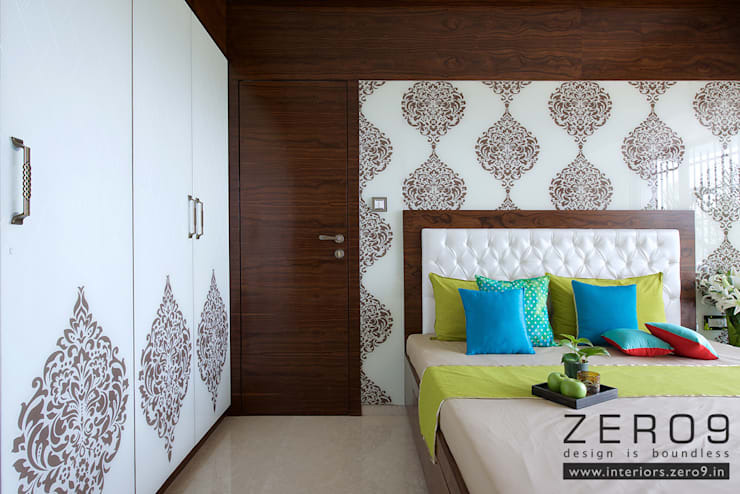 The stylised back painted glass with a motif pattern inlayed brought a subtle mix of classic touch to the modern bedroom. The window seating enhanced the light quality of the bedroom and made space for a cosy daytime reading. The TV backdrop laser cut in White Acrylic sheet rests over a beige painted wall creating a perfect contrast for the muted window setting. The mirror with etched pattern sits within the niche to reflect partially the room depth. A clean stylish kitchen was achieved using a white quartz platform and dado complimented with the duco finished shutters in white enhancing the brightness of the available light. ["IN"] [Published] How to make your home a happy place with interior design ideas? ["IN"] [Published] How to decorate your living room?